"Treehouse is one of the best games I have played. Why is that? It's fast, easy, and small. Whenever I go to a family function, you can guarentee that Treehouse is in my pocket. My son and I will play it while sitting around a table with other family members. Since the game is so simple, you can carry on a conversation with others while playing the game. It sure makes those functions go by faster." -- Troy Davidson's comment on a BGG thread called "The ever changing Treehouse of Icehouse"
Martian Coasters are at the Printers! A month ago, I announced that I'd come up with another new game, called Martian Coasters, and that we'd decided to put it on the fast track to production. I'm pleased to report that the art for the coasters has been sent to the printers, and we're on schedule to have the game available for sale in November! The other 3 coasters will have different designs on the back. One will feature an overview of the rules for Martian Coasters, the next a guide to Icehouse Terminology, and the last will feature this same view of Mars, except during the day. 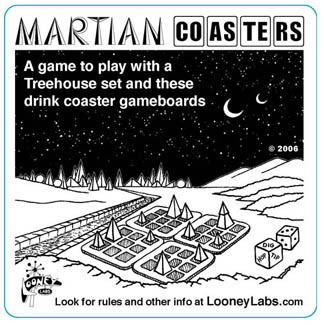 To help promote the launch of this cool new product (and to help convey the fact that it's an expansion set for Treehouse and you need a Treehouse set to play), Kristin has come up with a marketing gimmick she's calling "The Crazy-Good Martian Coasters Special." The retail price for Martian Coasters will be $6. Please ask your Friendly Local Game Store to pre-order it now, and be sure to tell them about the Crazy-Good Martian Coasters Special! Another thing that happened a few weeks ago was that Susan Goldstine came to town, to work on a big mobile-making project. Alison has been into making mobiles for a while now, having gotten the bug (and know-how) from Russell, and she in turn has been getting others interested in the craft. Now, Susan is pretty crafty too, and she's a math professor, so she really loved the idea of the Fibonacci-inspired mobile that Alison gave Kristin's Dad (who's also a mathematician) for Xmas a year or two ago. She liked the idea so much, Susan decided to make a Fibonacci mobile to hang in the hallway of the Math Department at the college where she works. 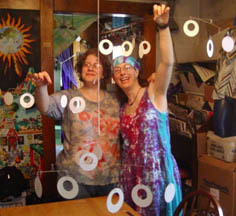 Here you see Susan and Alison with the almost-finished parts of the Fibonacci Mobile... for more details, photos, and diagrams, go see the page Susan posted about it! It dawned on me last night, while watching the Lost season 3 opener, that the main character has the same name as a now-obscure historical personality: Jack Sheppard. (The original Jack Sheppard was a thief who became famous for breaking out of prisons over and over again, early in the 18th century.) It's probably just a coincidence, but on this show, you never know. Various Lost-watchers have noted that the character name Henry Gale is undoubtedly a Wizard of Oz reference, so perhaps other names are clues as well. So maybe this Jack Sheppard is destined to break out of the prison that is the island they're all trapped on.